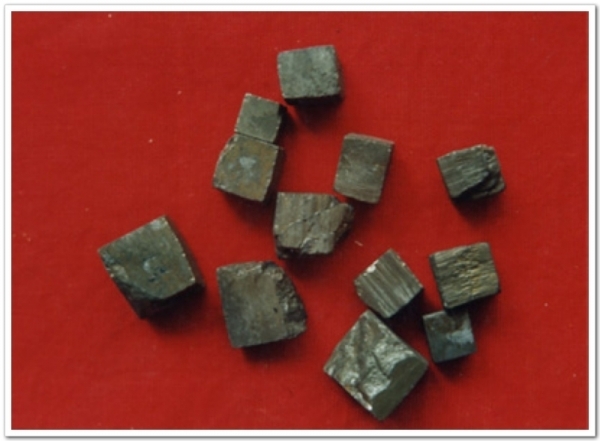 The iron pyrite of sulfide mainly containing FeS2. Sichuan, Hunan and Yunnan provinces in China. Regular, yellow with brightness, metalic luster of cross section. Smashed, calcined by fire and quenched in vinegar, made powder or refined with water. Pungent, neutral; liver and kidney meridians entered. Dissolve stasis and alleviate pain, reunion bones and cure trauma. Traumatic injuries, bone fracture and soft tissue injuries, congestion, swelling and pain. This herb has the actions of dissolving stasis, alleviating pain and promoting healing of bone fracture as a specific herb of traumatology. It is used both internally and externally. It is usually combined with blood-activating and trauma-curing analgesics such Xue Jie, Ru Xiang and Mo Yao, etc. Decoct 10~15 g, 0.3 g in powder. Proper dose for external application.